As every resin model, much care is needed when removing and cleaning the pieces, particularly the smallest ones, because the risk of damage is very high. As every other GBModelli kit I had the opportunity to review, casting is of the highest quality, flash is limited and very easy to clean and every piece falls in the right place without too much fuss. My sample had some microscopic holes scattered around as the result of tiny bubbles formed during casting: almost all of them were filled by the various coats of primer, paint and weathering. I went for the later version of the turret (with the cylindrical FIAT 14/35 machine guns), so I did not bother with straightening the earlier SIA mod. 18 machine guns, which are very nice but definitely bent and difficult to detach from the resin block. The wheels and the return rollers are very small and have many attachment points to the block, so they need an accurate cleaning. The side skirts with suspension and wheels come in a single, rather long piece which came out slightly bent, so it must be kept in place with supports while glue dries. There was a cross-shaped support on the upper part of the tail which was not reproduced in the kit because it was impossible to cast it as thin as it has to be, so I scratched it with plastic card; behind it, on the upper border of the tail, a hook was present, supporting a chain with squared links which progressively disappeared during the long life of the tank. That hook is not present in the kit and was easily scrathchbuilt. 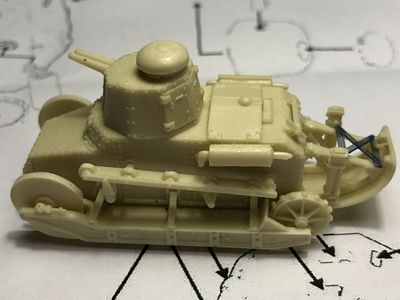 This article has all the information needed to finish a model of the FIAT 3000. This vehicle was operating in Sicily, 1943, during the Allied landing, so it was painted in dark green spots FS14036 on a red brown FS30109 base. The license plate and markings come from Italeri M13/40 fast-build kit. The FIAT 3000s operating in Sicily were very clean (they had been inspected by the King of Italy during an official visit some months earlier ! ), so weathering is minimal. The figure comes from the Italian Infantry by Airfix.